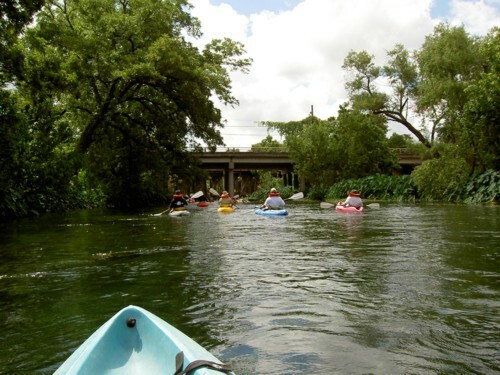 A couple of years ago some of the men from our church and our pastor made a kayak trip down the San Marcos river. They enjoyed it so much that they made a trip the year after that. A new member was baptized on that trip. So it was with some excitement that we looked forward to this year's trip. About thirty men from the church from teenagers to my age left the church at 7:00 and headed for San Marcos. We took the 27-passenger bus, the 18 passenger van, a pickup to carry a portable grill, and three other guys drove out there on their on. One of my sons wanted the three of them and me to go, but my youngest son had to work. Our directions weren't clear so we did a little driving around before we finally got to the canoe rental place. 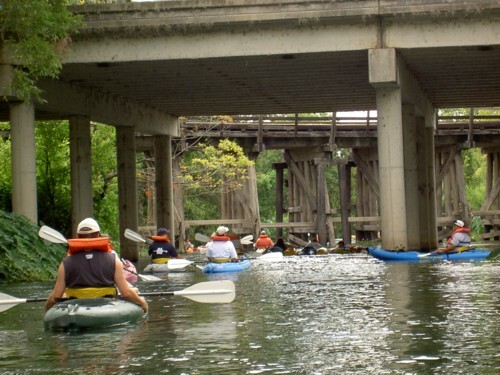 We drove down CR 166 and crossed the San Marcos River on the low water bridge and then turned around and went into town. We met the three who had driven to San Marcos with their wives the night before. We got breakfast (or lunch) at Wal-Mart I think and then boarded the bus quickly because we were about to be late. We got to TG Canoe Livery at 11:00. They were anxious to get us through the mandatory safety lecture and on to the river so we have time to make it back at a reasonable time. We listened to the safety presentation and watched a series of pictures of distinct locations along the river and then signed the paperwork. They hauled us in an old school bus to the old City Park San Marcus. 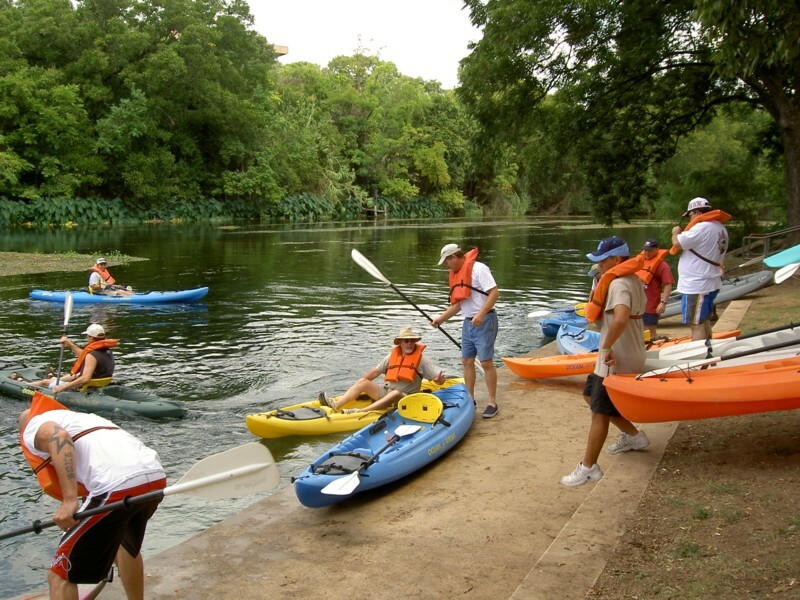 The kayaks were already in place so we chose the ones we wanted and headed for the water. 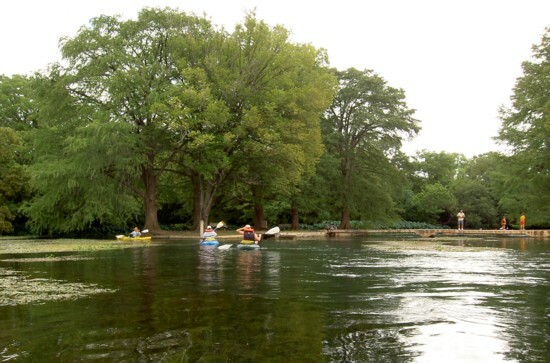 The San Marcos River starts at Aquarena Springs. The spring is so deep and the water is so clear that they used to have underwater shows complete with a swimming pig. Maybe they still do. As I remember it, there was an underwater viewing room. There was a chicken that played Tic-Tac-Toe among other amusements around the spring. There is a tremendous flow of water from the spring as you'll see in these photos and they say that the temperature is 72 degrees all year round. 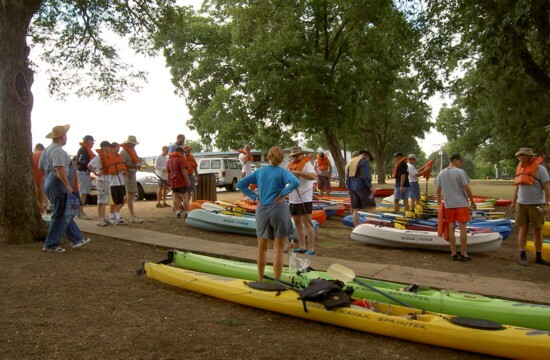 And thus this odd assortment of young to old guys dressed in shorts, T-shirts, and ball caps to long pants, long-sleeved shirts, and straw hats set out for the trip down the river. The TG Canoe Livery brought us to the old City Park where the Lion's Club has a tube rental service. 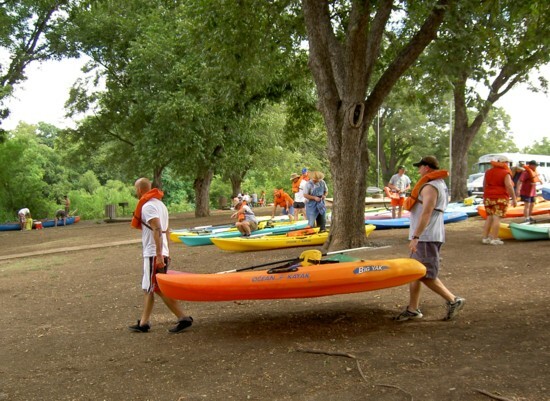 The kayaks had been brought to the park in advance and were waiting for us under the trees between the parking lot and the concrete walkway on the bank of the river. The location is identified as No. 2 on the map. The float trip service had explained to us that it was easy to carry the kayaks by the buddy system as these two young men are doing. We looked around at the kayaks and tried to pick the best for our use, but obviously some just got whatever was left whether it was a suitable choice or not. A few had to swap along the way down the river to get a better fit. 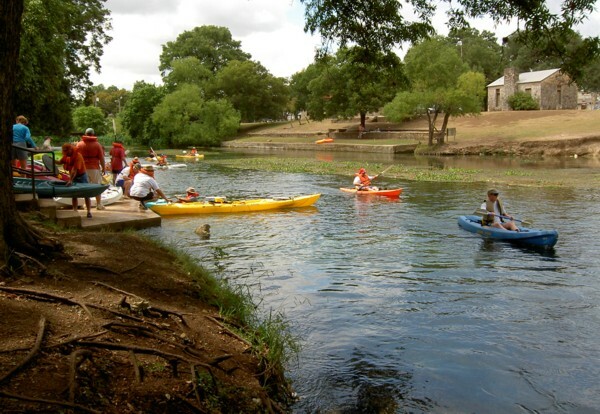 The Texas State University - San Marcos is on the right bank of the river. Those who reached the water first, moved on out into the river and paddled around for practice while waiting for the others. We wanted to start together although we had been told that there would be tight places that would require us to go single file and to wait until obstacles had been cleared by others before going through ourselves. Just a short way down river from the City Park, Highway 82 and a railroad cross. 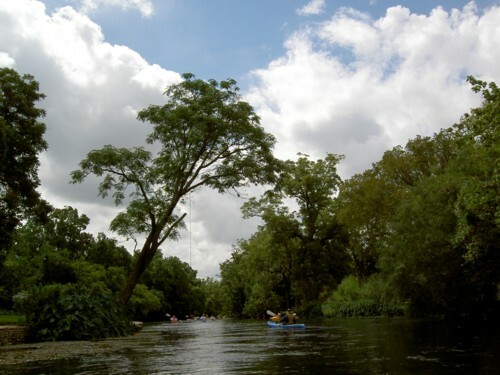 The River is broad and slow in this section and is a great place for beginners. That's why it is used for inner-tubing; it is great for the whole family. I was a little concerned, though, about getting through the bridge pilings. I could just imagine swift currents tangling my in the pilings and cross-members of the railroad bridge. Getting through the space between the pilings wasn't too bad, but it was swift. I tried to line up with the current to just coast through. Since my camera was not waterproof, I was carrying it in a ZipLock plastic bag. I had a washcloth in with it to help absorb leaks. I had taped a nick-strap around the bag so that I could keep it safely around my neck. It was a little difficult to unzip the camera, aim, and shoot while trying to keep the kayak lined up and without losing my paddle or falling overboard. Unfortunately, my camera didn't have a wetsuit, and the kayak didn't have a mount I could safely place it on. The east side of the River in this area seems to be private property. East is to the left as we go downstream to the south. There is a rope swing hanging from the tree over the River and a stone wall protects the bank. I turned to look upstream and see how my sons were doing. Louis is in the blue kayak and Jim is in the green one. The "swing tree" is in the background with a view of the beautifully landscaped bank. This is the island at Bicentennial Park (No. 1 on the map). The bridge coming from the west bank was too low to go under. That branch of the river may have gone over a dam. The east bank was a shallow gravel bar, but it was deeper and swift at the end of the island. Jim and Louis had gone on ahead of me. 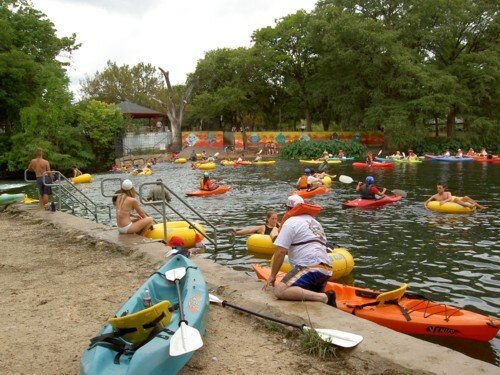 The easy section of the river ends at Rio Vista Park where all the kids come to swim and paddle around in their tubes. It is at No. 6 on the map and about one mile from our starting point. Many of the kids rode their tubes through the gap in the dam and some even body-surfed through it. I still wasn't wet and didn't want to get wet so I carefully got out of my kayak and pulled it up onto the bank where I took this photo. Can you imagine a group of about thirty grungy looking men paddling through this group of young kids? Most of us had pretty grim, serious looks on our faces and of course the kids were just having fun doing what they do all summer! One easy mile complete and only six more to go! The Beginning - The beginning of the trip and our float from the San Marcos City park to the swimming hole in the river above the dam of the dam at Rio Vista park. Baptism/Rough Water - Some go around the dam at Rio Vista and some go over the dam. 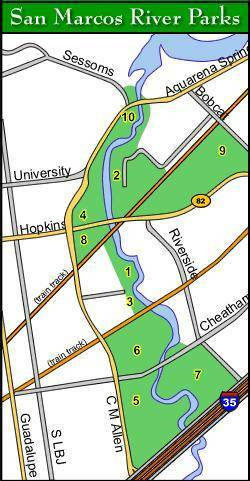 We continue on a swifter section of the river where we incountered more obstacles. We assembled at a dam that split the river into two parts and faced the decision of portage or tackling a rough section of the river that we had been warned not to take. The most challenging part of the river is difficult to photograph while trying to stay in the kayak, in the current and keeping the camera dry. 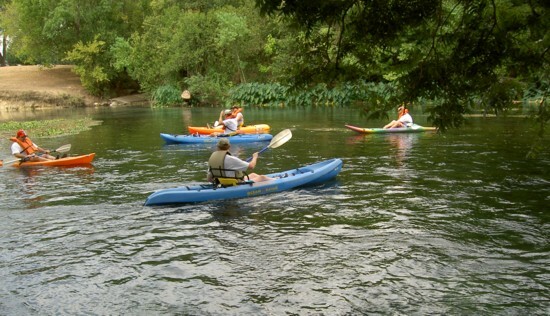 Slow Stretch - The Blanco River joins the San Marcos at a big bend in the river. The river was wide and deep with a slow current as it was held back by a big, old Cummings mill dam. Final Passage - Big cypress trees. A floating pack of young tubers help me quench my thirst. Back at the camp for supper.